At Jesus’ Baptism, his Father in heaven speaks to him in the hearing of others: “You are my son, the beloved; with you I am well-pleased.” Luke tells us that Jesus is at prayer in this moment, with his attention likely turned within. By contrast, in his temptation, the devil appears to him and speaks to him in his immediate presence, tempting him with things seen or imagined. Our Father in heaven speaks to him from above. But the one he calls ‘the father of lies’ speaks to him from his side, about the things of this world. 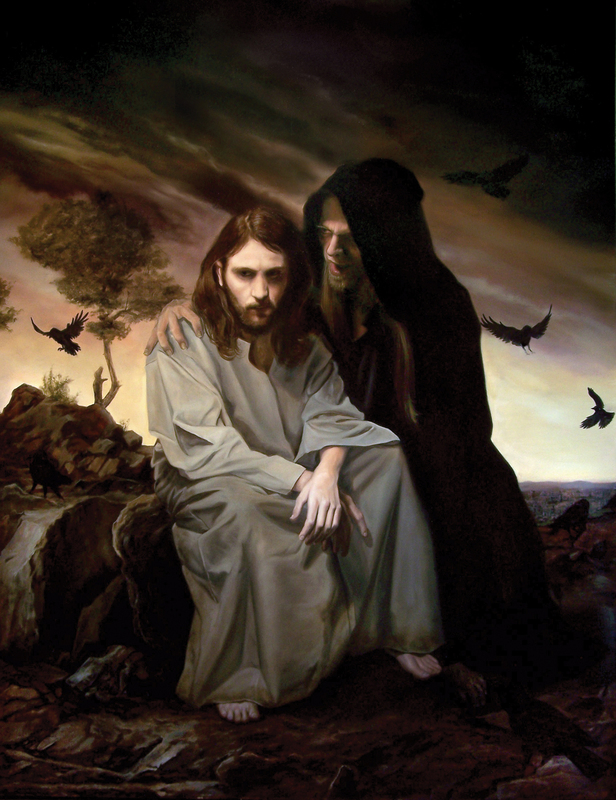 It is in relation to this point that I find Eric Armusik’s perceptive painting of the Temptation of Christ so compelling. Look at that sinister-looking hooded face, and that claw-like hand on Jesus’ shoulder. The tempter speaks in his ear, to turn his attention away from his mission. In the process, the tempter offers to Jesus what he might be tempted to desire. A dark brooding sky obscures the light from above, and accentuates the dark ground underfoot. Jesus looks resolute while yet affected by the experience of his temptation. Eric Armusik captures how Jesus is tempted in every way that we are, yet without sin. We are likely, always, to hear this same voice in our own ears. Sometimes the voice speaks strongly and directly, and sometimes it is only a whisper. But the message is the same: ‘Look at this beautiful sight! Look at this wonderful thing. It could be yours! Yes, yours.’ And in that moment, we are likely to forget the words of the Psalmist, who reminds us how “the earth is the Lord’s for he made it; come, let us adore him!” In the moment of temptation, the Father’s voice from heaven seems less immediate than other things grabbing our attention. Instead, we give preference to the voice from the side, which says, “go ahead! It will be ok ~ after all, it’s ‘good’!” So, ‘when we see that the tree is good for food, and how it is a delight to our eyes, and that the tree is to be desired to make us wise, we take of its fruit and we eat; and we also give some to our families and friends, who are with us. And in that moment, we know we have sinned, for we experience our separation from our Father in heaven. Whether we are considering the history-changing choice of our biblical ancestors, or whether we are thinking about our own choices, temptation has more than one reference point. The obvious one, is whether we choose the path toward sin ~ to accept the allure of appropriating some good or beautiful thing, but in a bad way, for our own ends. The other opportunity provided by temptation is the choice we might make for the good ~ to seek and follow God’s will, and live more fully into God’s ways for us. Temptation always has a benefit that we should never forget ~ whenever we are tempted, we can choose to live more nearly as we pray. The Temptation of Christ, 2011, by Eric Armusik. The image is reproduced here with the artist’s permission. To see more of his fine paintings, click here. Also see the Temptation passage in Luke 4:1-13; Hebrews 4:15 (quoted above); and Genesis 3:6-7, which I have paraphrased. My reflections here are drawn from my homily for Lent 1, which explores the themes suggested by the Temptation of Jesus (click here).